Initially deployed in nursing homes and senior care centres, the strength training programme is now available in eight community locations. 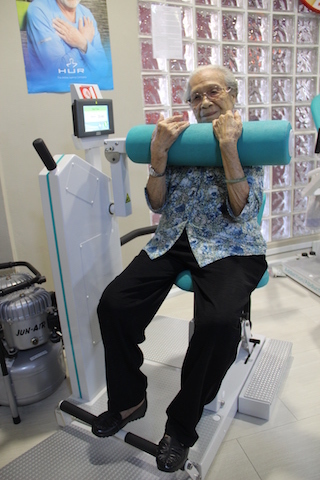 Ninety-seven-year-old Lau Soon Siang using the Gym Tonic at Care Corner. Initially deployed in nursing homes and senior care centres, Gym Tonic, the evidence-based strength-training programme conceived by the Lien Foundation and health technology company, PulseSync, is now available in eight locations for elderly community dwellers. They include ActiveSG Gym@Our Tampines Hub, Bishan Community Club, Care Corner Senior Activity Centre (62B Toa Payoh), Man Fut Tong – Ho Yuen Hoe Senior Care Centre, Methodist Welfare Services Senior Activity Centre (Fernvale), St Hilda’s Community Services, TOUCH Community Wellness Hub, and Peacehaven Community Club. Joining fees vary from centre to centre and range from less than S$10 to S$50 per month. Lien Foundation isn’t stopping there – five more new community locations are being planned for next year. More than 1,400 community-dwelling seniors are expected to benefit from Gym Tonic. By 2019, Gym Tonic will grow to more than 32 locations, targeting to benefit an estimated 4,500 seniors in the community, nursing homes and eldercare facilities. The joining fees are affordable and vary from centre to centre, ranging from less than S$10 to S$50 per month. A Lien Foundation study found that by putting seniors on a three-month prescribed exercise routine on these software-enabled gym machines designed to be gentle on seniors can help reverse physical frailty in the elderly. The 2017 study involved 396 seniors from nursing homes and senior care facilities. Frailty is a common clinical condition in older adults that carries an increased risk for poor health outcomes, including falls, hospitalisation, disability, institutionalisation and mortality. It is marked by weight loss, weakness (low grip strength), exhaustion, slow walking speed and low activity. Anyone who meets three or more of these five criteria is characterised by researchers and the medical community as “frail”. Those who have one or two of these symptoms are categorised as “pre-frail” and at high risk of becoming frail. Those with none of these symptoms are considered “robust”. The Lien Foundation study found that after the three months of strength-training exercises for 30 minutes, twice a week, 41 and 55 percent of frail seniors in the nursing homes and senior care centres respectively on this regime progressed to the pre-frail state. What was also interesting was there were positive results even for the community-dwelling seniors involved in the study – one in four of them improved from pre-frail to robust. Gym Tonic currently has 2,000 active users on its exercise programme at the 25 Gym Tonic sites. The sites are equipped with pneumatic gym equipment that gently builds the elderly’s core muscle groups. 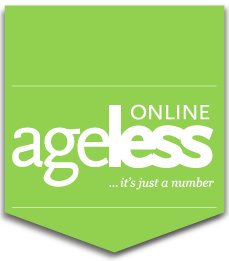 It is backed by smart software built from proven Finnish research which tracks the seniors’ progress supervised by Gym Tonic-trained staff. When the elderly regain their strength and functional abilities, they experience more than just physical gains. Self-confidence, social connections and autonomy are other equally important benefits. Take for instance, 69-year-old Chin Nyok Chu. Before she started on Gym Tonic, she complained of backache, poor balance and weak limbs. She had to use a walking stick and could not walk long distances. At home, she needed help to even open a can of food. However, after 12 weeks of strength-training exercises, Nyok Chu has no more pain in her legs. She no longer needs a walking stick and walks more confidently. She can walk up to 1.5km at one go, twice as far as before. She can now stand up for a longer period of time. She has also lost weight, looks and feels better and has returned from a holiday in China. There is also 97-year-old Lau Soon Siang who had a fall that hurt her back and weakened her physically. Her balance and muscle strength became poorer. However, after completing the Gym Tonic programme, Soon Siang has improved significantly, with improvement in her lower limbs’ muscle strength and better balance. She is able to resume walking to the coffee shop to meet with her friends. As Singapore ages, a rising number of seniors will show signs of frailty, which could lead to increased risk of poor health outcomes. It is estimated that close to half of community-dwelling elderly in Singapore is frail or pre-frail. This means higher care needs and risk of isolation as well as increased healthcare expenses for this group. “Early action to fight frailty in the elderly must be a priority for an ageing population like Singapore,” said Lee Poh Wah, CEO of Lien Foundation. “Gym Tonic has shown that physical decline can be reversed with strength training. With timely intervention, we can reduce the loss of functions experienced by seniors and lessen the growing strain on long-term care resources. ** Lien Foundation was inviting 300 community-dwelling seniors aged 65 years old and above, to try out Gym Tonic. If selected, they receive strength training under the supervision of qualified Gym Tonic trainers and taught tips on good nutrition. The free trial has been oversubscribed, however, do submit your interest at www.gymtonic.sg/signup/ but there will now be a fee. For instance at Care Corner, the fee is S$180 for six months. Hi. Do they also provide a pickup from home (and return) for elderly in wheelchair? Sorry for the late response but you might need to call them directly and ask them.